Life is good for Brad Paxton, who once thought he’d go very far at Eastman Kodak Co.
Brad Paxton with a Still Video Transceiver, an Emmy Award-winning technology he helped to create while at Eastman Kodak Co.
Brad Paxton came back from a business trip in 1991 to find a large envelope on his desk. It was a retirement package. He was in charge of electronics research at Eastman Kodak Co., and at age 53 felt like he was at the top of his game. His worked on the Still Video Transceiver, which won an Emmy Award for helping make it possible to transmit news coverage digitally. 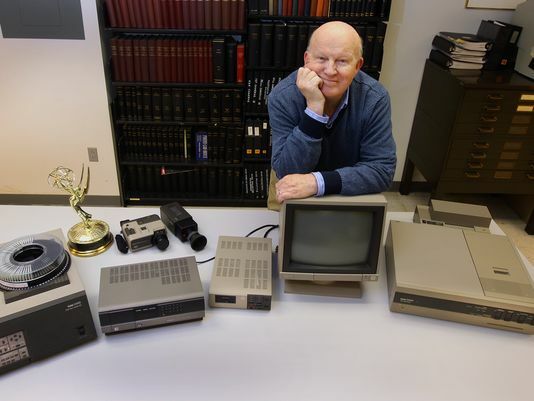 It was the dawn of the digital imaging era, and Paxton wasn’t ready to retire. But the retirement package was attractive, and he worried that the next invitation to leave might be less voluntary. He also realized that he could take the package, and still do the work he loved. Paxton started doing consulting, and one of his first clients was a big one: the U.S. Census Bureau. It had just finished processing millions of forms for the 1990 census, manually transcribing content from each form into its computer system. The bureau knew it couldn’t do the 2000 census the same way. At Kodak, Paxton had worked on a high-speed scanner that captured documents for storage on microfilm. It could also be used to create digital images, and Paxton knew that the use of optical character recognition, or OCR, software could help automate the processing of census forms. Paxton built two prototypes, one at the Census Bureau’s offices in Maryland and another in a lab at RIT. He helped the bureau find a contractor to set up processing centers and oversaw progress. The biggest challenge was figuring out how to ensure that information was captured accurately. The forms, after all, were written by hand. How could the bureau test whether the OCR software deciphered it correctly? Paxton helped come up with several patented methods for testing a processing system. One involved creating synthetic data sets based on a massive library of handwriting samples. This allowed the bureau to create test forms that mimicked the real ones, and test whether the software deciphered the contents accurately. Paxton’s team also developed a more complex system for testing scenarios when you don’t have real data to compare against. In practice, census workers found that about 1 percent of what they processed needed manual intervention, and most of those were undecipherable even by humans. After that work with the 2000 census, Paxton formed Advanced Document Imaging with Akram Sandhu, a colleague from his days at Kodak. ADI continued to work with the Census Bureau, playing a major role in processing the 120 million forms collected for the 2010 decennial census. ADI has expanded its work into fast-growing fields such as medical records and insider threat detection, and its major clients now include the Internal Revenue Service and the Department of Defense. With offices at Canal View in Brighton, ADI employs about 12 people, and ramps up to 30 during the peak of census season. The firm is one of several dozen local companies founded by former Kodak employees in our area. Most are driven by folks like Paxton who wanted to continue the work they started at Kodak and to keep pushing the leading edge of their technology. Lahman’s patents column appears in print on Sundays. Follow him on Twitter @SeanLahman, or reach him at (585) 258-2369.